When oxidation and reduction occurs together, this is known as Redox Reaction. Oxidation involves the loss of hydrogen. Reduction involves gain of hydrogen. 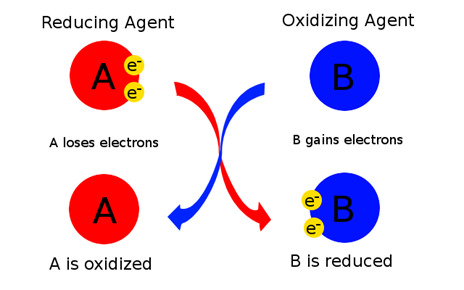 Oxidation is defined as loss of electrons. Reduction is defined as gain of electrons. The easiest method to learn oxidation and reduction is LEO-GER/OIL-RIG system. OILRIG stands for Oxidation Is Loss and Reduction Is Gains. IN ELECTRONS. LEOGER (leo the lion says grr) stands for Loss of Electrons = Oxidation while Gain in Electrons = Reduction. Oxidizing agent is a substance that oxidizes another substance but itself gets reduced. For example, Sulphuric acid, oxygen, ozone etc. Reducing agent is a substance which reduces another substance but itself gets oxidized. For example, hydrogen, lithium, iron, zinc etc. The method used to balance the redox reactions is called the Half Equation Method or ion electron method. Each equation is balanced by adjusting coefficients on both the sides, that is, reactant as well as product side. Balance the electrons in both the equations. In this case multiply the first half equation by 3.